Reclaim the Screens!- Media facades become an agora for the public audience to post messages and comments. The SMSlingshot is empowering the people through expressive tangible device to put own statements on the screens. The SMSlingshot is a digital intervention device, equipped with an ultra high frequency radio, hacked arduino board, laser and batteries. 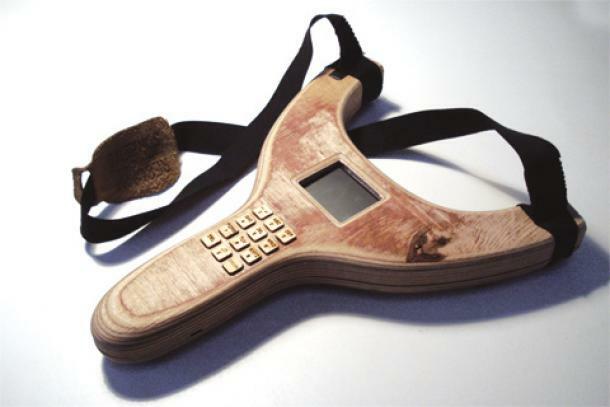 Text messages can be typed on a phone-sized wooden keypad which is integrated in an also wooden slingshot. After the message is finished, the user can aim on the media facade and send/shoot the message straight to the targeted point. It will then appear as a colored splash with the message written within. VR/Urban is a collective of public media interventionists founded in 2008. Since than they work together in the fields of interaction design and media art. The work of VR/Urban has been exhibited in Boston, Riga and several times in Berlin. The aim of all projects is to reclaim urban screens for the public. In tradition of situative art and graffiti culture, VR/Urban augments existing city structures with interventive and interactive media-art. The core persons behind the VR/Urban group are the media computerscien-/artist Patrick Tobias Fischer and the designer, Thilo Hoffmann and design researcher Christian Zöllner. The team members are fluid elements of partners and friends in the fields of art, music, design, science and architecture.